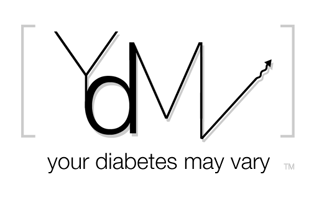 I am a huge fan of #dsma, the weekly twitter festival of all thing diabetes. (Wednesdays. 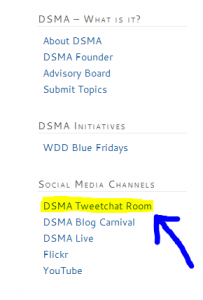 9:00 pm eastern time follow the tag #dsma) It is wonderful because Cherise is more wonderful. You can show a little Love Ya Mean It by nominating Cherise too. Paste @Diabetic_Iz_Me into the form:http://shortyawards.com/category/socialfitness and ad a reason why you nominated her. Send a tweet like this: I nominate @Diabetic_Iz_Me for a Shorty Award in #socialfitness because of weekly #dsma chat 4 living well w/ diabetes. The contest wants you to be creative with the reason. A tweet without a reason for the nomination will not be counted. So don't forget that part, OK? 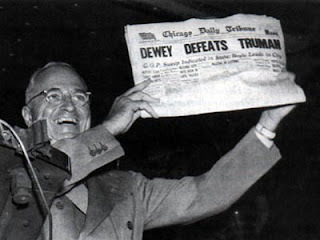 We want votes to count. The rules say a nomination must be relevant to the category. There is an easyone, Cherise is about as relevant to social fitness as is possible. Through #DSMA she helps people living with diabetes live health, fit, spiritual, emotional, rational, and irrational lives with all type of diabetes. The #SocialFitness Shorty Award, in partnership with Anthem Blue Cross and Blue Shield’s Health. Join In., honors an individual who helps others to make healthy choices in their lives through their influence on social media. More here. You can vote for Cherise in as many categories as you want, as often as you want, just make #SocialFitness one of those votes. Only one nominee and one category per tweet. ReTweets (RTs) are eligible provided the account and nomination meets all the other requirements. Come on DOC - share the love! Abby has a piece on SixUntilMe about her first day on the job as an RN, a low during orientation and a new coworkers calmly asking “Are you OK.” A spectacular piece. I particularly love the way she speaks of those three words. I highly recomend that we parents out here diabetes land read this and think about ways of talking with our kids about diabetes in ways that are: comfortable, not stressed, no freak out, skip the worried look and simply let them know we are there for them. It ain’t easy. It is a great goal. I'll try. I'll slip up. I'll try again. 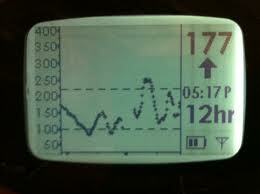 Christopher and Dayle write at A Consequence of Hypoglycemia writes about how they would improve the Dexcom CGM. Since I am out there advocating that people talk about what they want from gadgets you may think I like this because Christopher and Dayle write about what they want from their respective gadgets in this post. OK I do like that, what makes this great is that the gadget are put info the context of how those devices effect the people they care about. They speak of time sensitive alarm volumes and custom alarms, kinda like selecting a ring tone on your phone. What is magic is they do that in consideration of the person next to them. Towards the end Dayle offers up the great idea of the Dexcom having a buddy system with other devices. Devices that play nice, what a concept. It is even more impressive when it is in the context of the devices supporting their loved ones as well as themselves. The idea that customizing devises so that people interact more comfortably, with less stress, fewer freak outs and simply dealing with the diabetes on the 'Are you OK' level seams so simple. In that it is revolutionary. *We can leave the waiter out of the equation but Kerri piece is so reminiscent of most of our dinners out with diabetes that I have to smile. Somehow dinner out is a particularly hard time to just ask "Are you OK?" Here’s a quick #TwoBits* around the DOC this week. Friday January 20, Join the TuDiabetes for a live video chat with C.C. King, Ph.D., Associate Research Scientist at the UC, San Diego Pediatric Diabetes Research Center. Dr. King will begin by presenting a brief overview of his research into stem cell therapy for type 1 diabetes, followed by a live Question & Answer session with the TuDiabetes community! There are a number of headlines about stem cells as a cure for type 1 that have been written in the past few days. They are based on a study out of China the reports to have reeducated lymphocytes aka T cells. I read this article and am left with far more questions than I am comfortable with. Josh Levy has a sound write up, I recommend his write up. In part here why I have questions. In other news this week identified CD8 T cells as the source of the autoimmune response that causes type 1.1 There is a quote from ViaCyte on Diabetes Mine that spoke to the difficulty of getting stem cells to differentiate into beta cells.2 For that I presume that getting a stem cell to differentiate into any specific cell is an involved proposition. The lymphocytes reportedly reprogramed in the China study are already differentiated cells. If the autoimmune process is stopped it is due to a modification or reeducation of these CD8 T cells. There are a myriad of CD8 cells and they are created in the lymph nodes to recognize specific antigens on the cells the are programmed to kill. Differentiated means a stem cell became a specific cell in the body. That is they started off as a stem cell and became a specific type of t cell. Very loosely hematopoietic stem cel in bone marrow become a common lymphoid projenitor that becomes a T cell. This study suggests that exposure to stem cells changes the existing antigen receptors. If that is true then why don’t the stem cell that become to the lymphocytes in our bone marrow have the same effect? I also fail to see a mechanism to explain how this erase the memory of the adaptive immune system. Why is it the type 1 autoimmune T cells that are reeducated and not say the one that provide immunity to chickenpox. I would hope that the news agencies that report this kind of study know enough to ask some basic questions. Among them should be how does it work, is it peer reviewed and has the study been repeated? #TwoBits Diabetes Sisters & Stem Cells at the Mine. Victoria’s Secrets holiday runway special has past, football is winding down so maybe we need some new fantasy league to talk about. How about insulin pumps? I had a fascinating conversation with Greg from Medtronic at CWD’s Friends For Life last summer on the topic of what would be my fantasy pump. A plausible device, that is one based on current technology, insulins etc.. I would say that a full artificial pancreas is beyond that scope but only a little. Yes it takes a particular lack of a real life to have fascinating conversations about fantasy pumps. 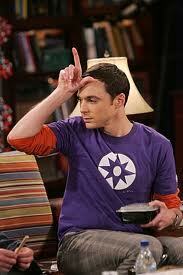 You can call me Sheldon if you must. It turns out for me the fantasy isn’t a pump, and so the talk expanded out to a fantasy diabetes management system. Greg asked if I thought FDA would approve my fantasy devices. I allowed as how they probably wouldn’t but industry would probably wouldn't make it either. Meet DEWY, he's a winner. I think the tools available to manage diabetes are fairly good. I think there is a significant opportunity for better diabetes care through breaking down the technological towers of Babble that separate devices from each other and our lives. My fantasy device would be a common collection point for diabetes information in a way that would facilitate managing lives with diabetes not just adjusting parts of those lives. Our meters, pumps, CGMs need to talk together and work through a common Diabetes User Interface. A D.U.I. WAIT! We can’t call it D.U.I.! That’s been used. How about DEWY for ah.. um.. er.. Diabetes Equipment Works for You. Dewy’s job is to listen for information from devices and lives. Then to integrate that into a possible responses. Dewy should work for us, patients, in our lives. Dewy should try to accommodate our individual life styles not define them. Dewy should help out with the basics. If we are low or high Dewy needs the wizard logic already in pumps to help calculate corrections or carbs based on our particular insulin and carb sensitivity. Dewy should have access to food databases with the ability to create a meal list in a way that approaches the ease of use of making play lists in iTunes. Drop and drag foods into a meal, easily adjust quantities of food in a meal, calculate carbs and even make note of fat, fiber and protein. Parents will want to be able to store these 'cause kids eat the same meal over and over again, by choice. Dewy should be able to help adjust boluses based on all of that but like any good friend of a diabetic not be too pushy about it. Dewy could even help out tracking trends. He could gently mention times of the day that he sees spikes. He could pay attention to our post workout BGs and see if there are trends worthy of note. Along the same lines Dewy could even try to pay attention to two hour post meal BGs and make suggestions about I:C rates. He could look for between bolus times when basals are responsible for what happening with BG and point out trends. Dewy would scream bloody murder if he ever sees serious overnight lows. He would turn off basals and wake up everyone and anyone we say with phone calls and text messages and keep at it until we tell him it is OK. That is just the kinda guy Dewy is. Some folks like patch pumps, some traditional pumps and some folks like shots. To accommodate those life styles choices Dewy should be independent of device manufacturers. That is Dewy should be able to accommodate what ever meter, pump or cgm an individual chooses. Dewy should be smart and tag along with us patients where we do our living, so he will need to reside on the smart phone or device of our choice. Dewy isn’t an artificial pancreas, not that he wouldn't be willing to work with one. An AP tries to be a pancreas. AP wouldn't care what you ate or if you worked out. Dewy being a really good diabetes assistant would, if we wanted him to, track what we eat or how our workouts impact our lives. Dewy would talk wirelessly to devices; pumps, meters, CGMs. He would do this securely and let us know if he is in touch or lost connection to devices. He would be the universal remote to the show that is our diabetes lives. When we change to a device that woks better in our life, Dewy could cope. He would have simple friendly ways to enter shots, exercise, and daily, weekly and monthly cycles. He would let us invent variables of our own because, well, our diabetes many vary. Until there are artificial pancreases, smart insulins, encapsulated implantable functioning beta cells and the cure that reverses the autoimmune glitch that causes type 1 diabetes families will need to manage diabetes. Managing diabetes will requires multiple devices to measure and adjust blood glucose but wouldn’t be cool if they all played nice? Well that’s my crazed fantasy pump. This got me wondering what others would see as a fantasy diabetes device? What is yours? Roche announced that they have FDA approval for the NANO in the US. Roche (SIX: RO, ROG; OTCQX: RHHBY) announced today that it has received clearance from the U.S. Food and Drug Administration (FDA) for its Accu-Chek® Nano SmartView blood glucose monitoring system. The new Accu-Chek Nano meter, which is smaller than a standard credit card, employs a large brilliant backlit display and does not require any manual coding or code key for enhanced ease of use. It also offers improved functions such as customizable test reminders, pre- and postmeal markers and average glucose calculation. The Accu-Chek Nano meter uses Accu-Chek® SmartView test strips and will be available to customers in the first half of 2012. At our most recent Children's Hospital of Philadelphia (CHOP) Parent Network meeting there was a newly diagnosed mom having a tough time. Diabetes is hard. Having a child diagnosed is devastating. Truth be told at every meeting, everywhere, there is almost always a family in the emotional deluge of a recent diagnosis. Why us, why now, we don’t know what to do. Our family has been there. Twice. The second diagnosiwas no easier even with the skills to manage it. Maybe because we had the skills and experience and knew more clearly what a diagnosis meant. That’s the deal with a diagnosis like diabetes. As I become closer to people living with other chronic conditions I learn that the flood of emotions associated with diabetes isn’t unique. A lot of my e-patient friends with other conditions to manage share similar stories. Many also share the value they have found in patent communities. There is a common theme of receiving much needed support from communities and ultimately providing. 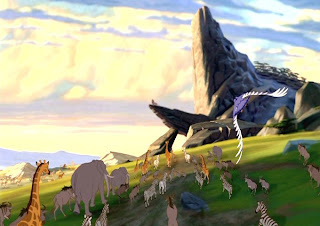 So climb up on Pride Rock and queue the music, that is part of the circle of support. Sometimes I wonder who is doing more for who in that process. Sure the newbie needs a shoulder to cry on. Still I think there are those with experience also have a deep need to offer that shoulder. The truly gifted turn the circle a little farther. The make their chronic condition valuable and see it as an ability. In there is a rock solid answer to, why us, why now, we don’t know what to do. Because you can be better for all the challenges you will face. You can be a little stronger and that is incredible. *Glu (myglu.org) is a T1D community launching this spring. I have been having fun with the beta. 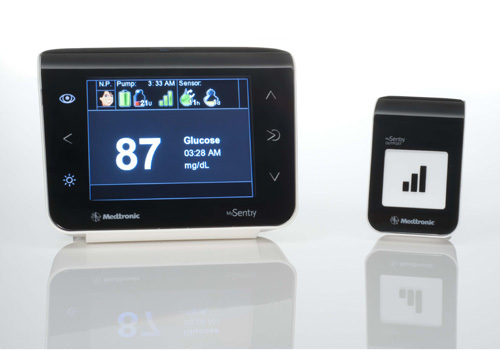 Medtronic announced that the FDA has approved the mySentry(TM) remote CGM monitor. It is a second screen that allows a parent to remotely see CGM data. Here's a picture from the Medtronic Blog where you can also find more information about the thing. The full press release is here. Version of something like this have been seen and talked about for years. It is great to see that Medtronic and the FDA managed to find a way to make patient information more available. For parents this has significant value. Particularly over night. Imagine checking BG without getting out of bed.